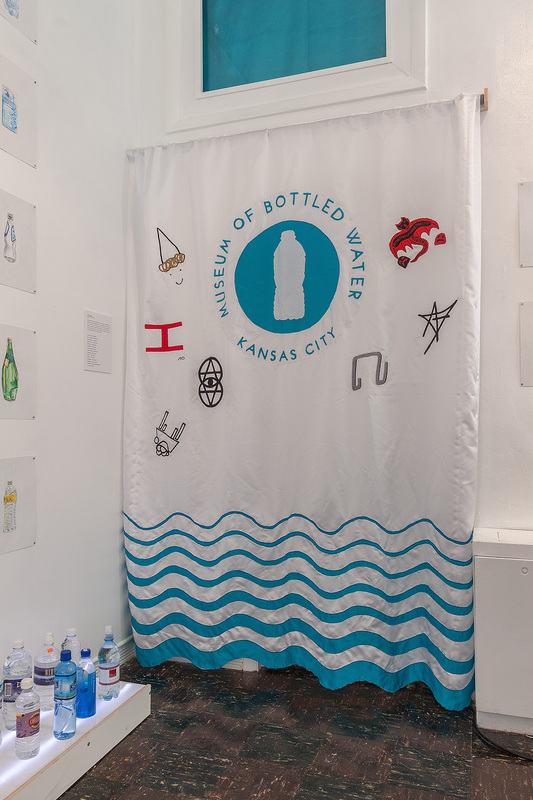 KANSAS CITY, Missouri — There are 324 bottles of water currently on view at the Museum of Bottled Water (MBW) in the Crossroads Arts District, some flat, some sparkling, and featuring labels from across the globe with an emphasis on US branding. The bottles are beautiful to observe and emblematic of the diversity of forms such packaging can take. Artist Neal Wilson started collecting the bottles in 2005 and is MBW’s public face, director, and docent. The collection includes a bottle of New York City water (directly from the tap, apparently), a blister pack, and a can of Emergency Drinking Water with a 30-year shelf life, though it could do with some more international examples. 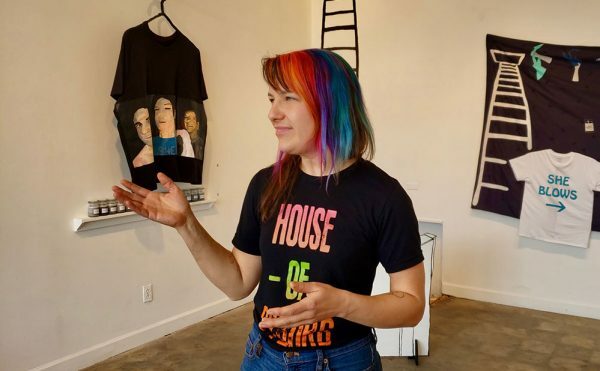 Though Wilson is its most visible participant, MBW is a collaborative project consisting of more than a dozen participants, including an architect (Elvis Achelpohl), a graphic designer (Seth Johnson), an artist-in-residence (Walker Tufts), and even a “fashion consultant” — Hadley, the clothing store hosting the pop-up museum for the month of August. The MBW’s installation offers an opportunity to appreciate the incredible array of packaging and marketing used to sell water. 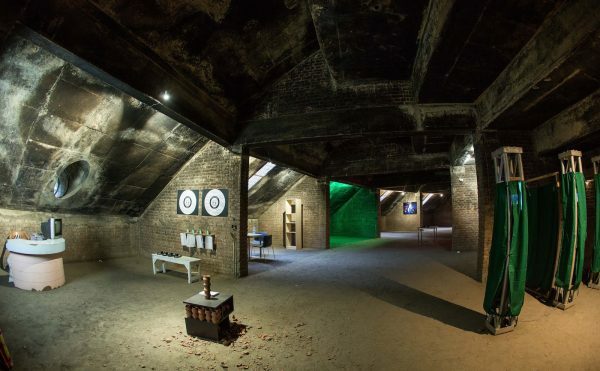 The collection’s display is rudimentary and visitors are allowed to handle the bottles. It includes more exotic examples like the Hawaiian volcanic water brand Waiakea and a brand named Boxed Water Is Better that comes in a milk carton-like container, alongside familiar labels like Evian, Fuji, Poland Spring, and loathsome newcomer Blk Water. It is interesting to see instances of cross-branding, like a Southwest Airlines/DejaBlue aluminum can of water and a much smaller, more eco-friendly package of plastic and foil from Japan Airlines. The Daum Museum of Contemporary Art in Sedalia, Missouri, even puts its own custom label on the bottled water it sells. Complimenting the displays are beautiful illustrations of the various packaging by artist Charlie Mylie. 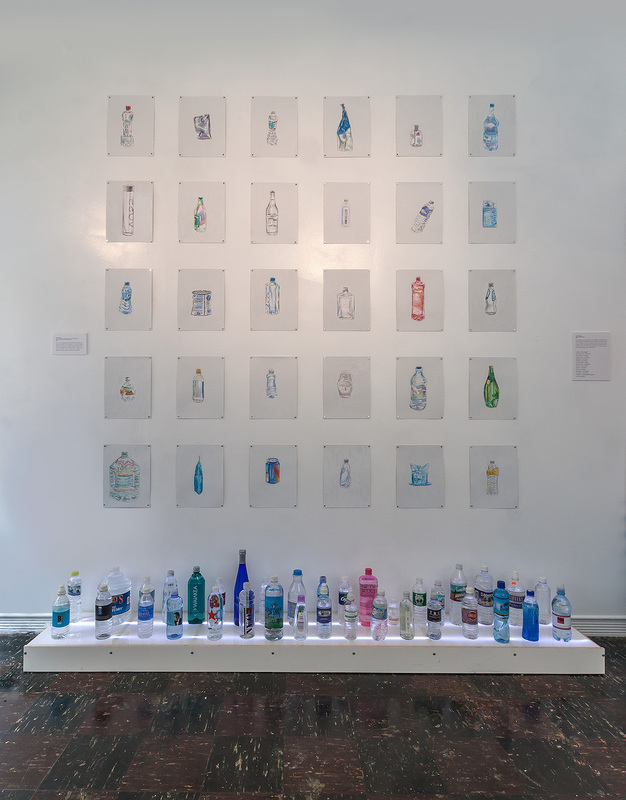 In his role as docent, Wilson offers public discussions of the collection on display and provides historical insight into the development of bottled water. He notesthat archeologists have discovered 2,000-year-old vessels for transporting water, and that holy water, which dates as far back as the first century, could be considered the earliest instance of branding water for sacramental uses. 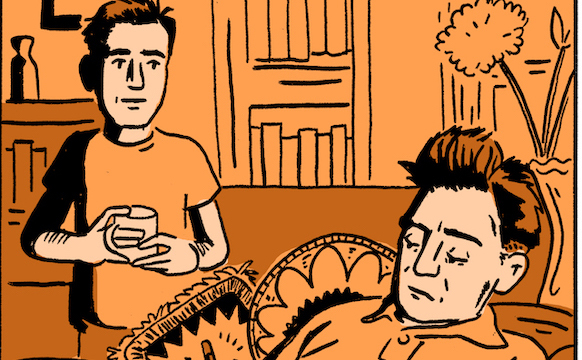 A more modern chapter in bottled water’s history that Wilson recounts is the rise and fall of Perrier. Its 1977 ad campaign is probably the first instance of bottled water being recognized as a consumer good, according to Wilson. The company’s advertisers deployed “street teams,” paying attractive young people to be seen in public drinking the stuff. As rapidly as Perrier’s market share rose, it declined just as fast after the discovery in 1990 of Benzene in the bottles. But the invention of the yuppie as a socio-economic category has made other bottled water brands, like Evian, more prominent. At MBW, visitors can serve themselves ice water from a glass jug. I am unsure if anyone noticed the irony in receiving free water while looking at a display of packages used to sell the exact same substance. Water is a political and environmental issue, driving populations to and from its sources. As we continue to evolve and adapt to the realities of climate change, the widespread use of PET plastics may be phased out in favor of more environmentally friendly concepts like the Ooho. The water bottle, in and of itself, is a brilliant concept: compact, mass-producible, and disposable. But in light of rapidly changing dynamics in civilization it is also on the brink of extinction. As climate change increasingly dictates global displacement, our future selves may look back at where and how we sourced water and shake their heads that so much of it was turned into a private commodity. It is my personal belief that every bottle of water purchased and consumed is a vote for its privatization. Access to this source of life must remain a basic human right. 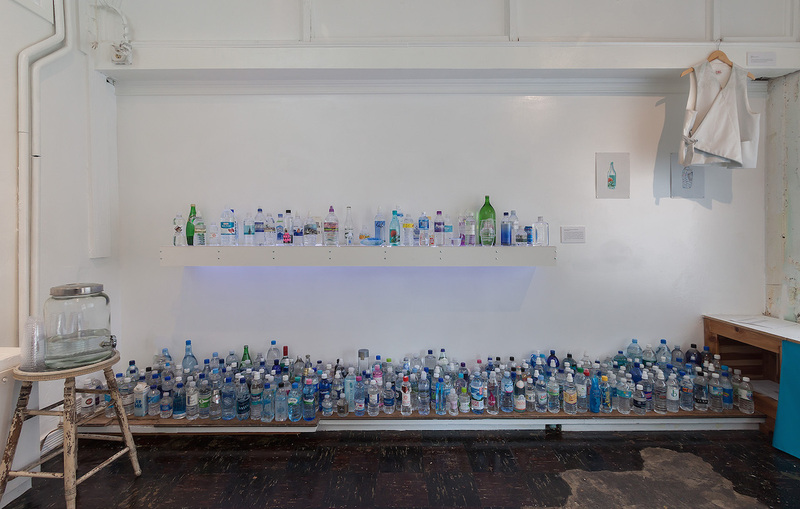 The Museum of Bottled Water is sparking a forthright discussion of potable water’s importance for survival. 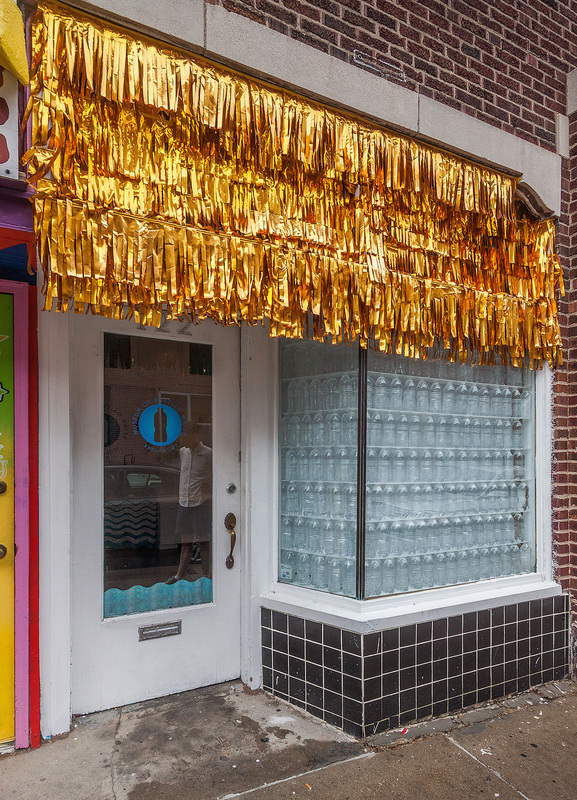 The Museum of Bottled Water is open at Hadley (122 West 18th Street, Kansas City, Missouri) through August 31.